Former President Thabo Mbeki appears to be intent on raking over old coals, by publishing a series of articles he claims he will cure people of the belief that he was paranoid in office. This has led to a series of suggestions about his role in our public life, and whether it should be greater than spending time in Sudan and other splendid corners of Africa. One of those proposals is that there be a “Council of Elders” that could play some role in government, perhaps an advisory one. The suggestion makes complete sense. But spend any time thinking about it what it would actually entail and you suddenly realise why it could not happen. Which also reveals how the ANC has mismanaged itself since 1994, and how Mbeki has been the major player, and possibly the root cause, of that mismanagement. By STEPHEN GROOTES. So far, Mbeki has written about two specific incidents during his presidency, but it does seem that there is more to come. The first concerned claims made in 2001 about a “plot” in which then Safety and Security Minister, Steve Tshwete, went on SABC TV and claimed that Tokyo Sexwale, Cyril Ramaphosa and Mathews Phosa were plotting against the president. The second incident is when Jeremy Cronin was accused of using the phrase “the Zanu-fication of the ANC”. Presumably, Mbeki is going to start getting closer to the present, which may mean we will at some point get some claim about Polokwane, and President Jacob Zuma. Based on these two articles, Number One is probably not quaking in his boots. All Mbeki has succeeded in doing so far is enraging those who felt he treated them badly at the time. Phosa and Cronin have both basically registered their exasperation. Cronin told EWN this week that “this shows he didn’t get it then… and he doesn’t get it now”. Phosa spoke of the pain that the entire 2001 episode caused him and his family. But, Phosa, being a magnanimous man, did then tell the Sunday Times that while he had personal differences with Mbeki, his wisdom should still be used by the country. This, he said should take the form of an elders council, which is not a unique, never before seen formation. Last year, Namibia’s then new President, Hage Geingob, said he was going to do something similar. He said it should be composed of the sitting president, and the previous two presidents. No doubt, other suggestions would come that perhaps it should include deputy presidents as well. Ramaphosa enters the room. Mbeki is already there. They glance at each other. Memories of 1994 and 2001 flood through Ramaphosa’s mind. 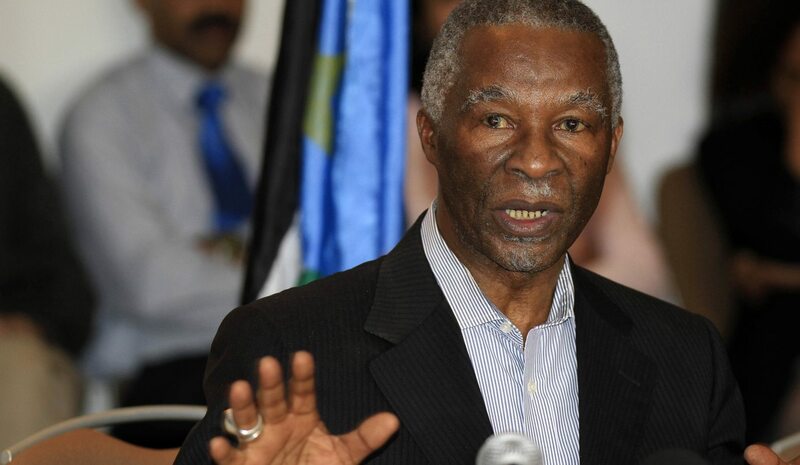 Mbeki looks up, ready to say hello…. and then remembers Ramaphosa in that 2008 NEC meeting, leading the charge for him to be recalled. Kgalema Motlanthe enters, quietly. Both men start, here’s someone I can talk to… but then stop, realising that to be caught chatting to him when Zuma walks in the room would be, well, awkies. Phumzile Mlambo-Ngcuka arrives, Motlanthe jumps up, at last, someone he can talk to. “Hi Phumzile,” he says, “How’s New York?”. “Fine,” she replies, “it gives me something to do”. She stops, realising the faux pax she’s just made. Finally, Zuma enters. He goes to the tea station. There is a difficult silence with the honey, the rooibos and Mbeki. Zuma replies, “No, I have someone here at the Presidential Guesthouse do that first. You should come and collect your stuff sometime… sorry you had to leave in such a hurry”. “Phumzile…” he beams, “how are you, and how’s Bulelani… still speaking so freely on his cell phone?”. “Think she’s still jetlagged from her DC award ceremony trip,” responds Zuma. When they finally sit down the same thought goes through all of their minds… if only FW had come. He would have reminded us of why we were altogether in the first place. The above might be political fun, but it shows the inherent problems with any kind of “council of elders” in this country. Everyone in leadership in the ANC has been involved in serious, nasty and ugly fights for power within the ANC. You would have the winners and losers of those fights around the same table. It is simply unworkable. Mbeki’s missives show that he is still fighting; he may have been defeated, but he is still fighting. This Mbeki’s retroactive fight could actually be seen as a proof of the ANC’s failure over the last twenty years. How is it that SWAPO in Namibia was able to keep it together, but the ANC has not? It cannot just be the difference in size and scale of the two countries and their politics. China has had the same group in charge for years, and while there has been the odd purge here and there, it hasn’t been quite so destabilising. Maybe that’s the cost of democracy; while the ANC is ultimately democratic, it’s hard to define exactly how the Chinese Communist Party chooses its leaders. It does indicate that no matter what you think of the ANC’s track record in governing the country, its track record of managing itself its lamentable. When power struggles reach the point that current and former leaders hardly speak to each other, you know something is wrong. One’s instinct at this point is to blame the party’s structure, or its past in exile. But actually, it could well be that there is one person who started it all. When Nelson Mandela left the ANC’s leadership, it seemed the party was unified. There were clear goals. Mbeki was elected unopposed. His claim of the 2001 plot involving Phosa, Ramaphosa and Sexwale was probably one of the first indications that something was seriously wrong. After that, it was inevitable that people would genuinely plot against him. It was his appointment of Bulelani Ngcuka as the first head of the National Prosecuting Authority that led to the mismanagement of the corruption claims against Zuma. And, possibly most importantly, it was his suspension of Vusi Pikoli at that same institution, that really opened the floodgates. After that, no one could trust anyone, and the conflict moved into a higher gear. Zuma used the abuse of the system against him to his aid in the run up to Polokwane. And, once he was able to take over that machinery, he would probably have had to be more than human to not make sure he had complete control of it. If someone has used something against you, and you have the chance to control it for good, wouldn’t you have done exactly the same thing? “One temptation of a leader elected unopposed is that he may use that powerful position to settle scores with his detractors, marginalise them and in certain cases get rid of them and surround himself with yes men and women,” he said.